Contrary to the report of the SP, our peaceful protest programme was well announced in advance that the activists and villagers will observe hunger strike in their own home in their own villages which were far away from the site of inauguration. The villages are located several kilometres away and on the opposite side of the river Narmada, where the inauguration function was organised. Protesting people had made it very clear that they will not have even a public protest on a common place but will only observe hunger fast in their own homes and put up a flag of protest on their own home in their private places and women will sing bhajans in their falia or village temple. The people of 70 villages were protesting peacefully in the areas and in the court of law on various issues related to their right to life, river, land, forest in this tribal area against the illegal attempts to take away their rights in the name of several projects including Kevadia Area Development Authority, Garudeshwar Weir-Dam and the Statue of Unity without the due process of law by the government of Gujarat. We have no complaint against Narmada police performing their above mentioned duty, but the SP’s report further says in the same paragraph that “… during this process, police did not follow any particular vehicle or put any guard on any particular house in Rajpipala. The allegation made by the complainant is totally baseless.” This statement by the SP is far from truth. 1. Four activists, Rohit Prajapati, Trupti Shah, Amrish Brahmbhatt, Sudhir Biniwale, were followed by police vehicles right form Devalia Chokdi when they were travailing from Vadodara to Rajpipala. When they reached the place in Rajpipala, to the campus of the Rajpipala Social Service Society, two police vehicles with police remained as standing guards outside the place as if they are criminals. No police officer informed us why they are doing so, what are the charges against us, but they checked each and every vehicle going out from the campus to check that Rohit Prajapati, Trupti Shah, Amrish Brahmbhatt, Sudhir Biniwale were not living the campus. They remained there throughout the night of October 30, 2013 and up to 2.00 pm on October 31, 2013, checking all the movements from outside. Women police were also placed at night to handle the woman activist. The police informally conveyed the message that they will not allow us to go out, and in case we attempt to do so we will be arrested, but refused to give any formal order. The photographs taken by our non-professional camera from inside the campus gate/fence show all this. 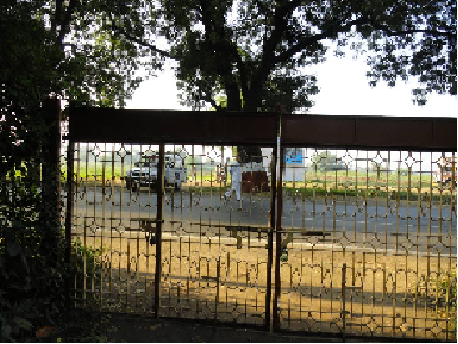 One vehicle was stationed opposite to main gate and other was just next to the fencing of the campus to prevent us from going out of the gate of the campus of the Rajpipala Social Service Society. This statement by the SP is far from truth. These persons were part of the struggle for people’s right to life and liberty and were campaigning in the 70 villages, likely to be affected by several proposed projects in this tribal area covered under 5th schedule, where the government of Gujarat had initiated several work without the due process of law, and without consulting tribals in the transparent way. Just 15 days earlier, on October 15, 2013 the Government of Gujarat invited representatives from 70 villages to have a meeting Nitinbhai Patel (then finance minister), Anandiben Patel (then urban development minister), Ganpatbhai Vasava (forest, environment and tribal welfare minister), and Shabdasharan Tadvi (MLA of the area) at the Forest Research and Training Institute, Gandhinagar. The government then trusted the peaceful method of this leadership. It arranged about five buses to bring the 3-4 representatives from each village from 70 villages from Garudeshwar to Gandhinagar. The SP has not revealed the fact that, apart from the above mentioned six persons, some other people were also detained. As we had no information about them at the time of sending this complain in the early morning of October 31, 2013, we have not mentioned their names while making the complaint. Some of the names are Viraji Viradia (a progressive Gandhian farmer undertaking organic farming in a village likely to be affected), arendra Tadvi, Dinesh Tadvi and Naresh Tadvi, (all tribals from various villages). All the above mentioned persons were part of this meeting held on October 15, 2013 with the Government of Gujarat and, as the process of negotiation was going on but not completed it was decided that people will held hunger strike and peaceful protest in their homes and villages but not go the site of inauguration. This was well announced in the press also. Thus the claim that “these persons were actively campaigning in various villages to create disturbances and chaos at the venue of the main function…” is not true. On the contrary, preceding two days of the event, Lakhanbhai Musafir personally informed the district collector that they will not do anything to disturbed the chief minister’s programme except the well-announced hunger strike, putting up flag of protest on their homes, and sing bhajans in their homes and villages as symbol of peaceful protest. If the police was clear and did not want to treat these persons as criminal, the question is why did they pick them up between late night of October 30, 2013 to very early morning of October 31, 2013 from their houses or farms? They were not allowed to tell their family members about their detention or where they were kept and not allowed to call to their families. There is no need for us to argue before the NHRC that these are legal rights of the arrested people. Every one’s (except Mr. Dipen Desai’s) cell phones were taken by the police as soon as they were detained, which were returned only after they were released. The fact is that only Dipen Desai’s phone was ‘by mistake’ not taken away by police and remained with him. He informed us about the where about of all the persons. He was one of those who was detained in the morning of October 31, 2013. Till 6.00 am of October 31, 2013 in the morning we had only information about several people taken away by police from their home and not about the reason or their where about. The moment police realized that Dipen Desai was contacting others from the police headquarters and sending photographs from his cell phone, his phone was also taken away. As we came to know about the where about of these people from Dipen Desai, we sent information to media and the pressure was mounted on the police. Media also informed police about the complaint sent to the NHRC by us. Due to this high profile event the entire media from all over nation was there and they started asking questions to police about illegal house arrest and detention. The behaviour of police slightly changed after that, and they provided snacks, tea etc. to the detained persons after 8.00 a.m. in the morning. The interview in the media took place at the police headquarters but not during detention. It happened only after the inauguration function by the then chief minister was over and people were actually released from detention. 5. Not only the people who were detained but the entire village population in several villages were terrorized and were threatened with heavy police presence on October 31, 2013 early morning till the function was over. 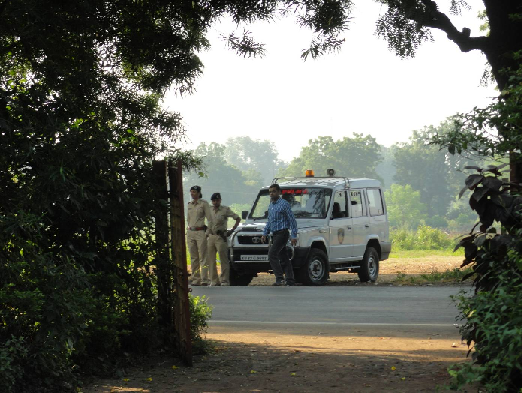 For example in Indravana village, which is far away from the site of the inauguration, police did not allow people to come out of their houses. Thus, practically hundreds of villagers were house arrested by the police. The village temple in which women were planning to sing bhajans was cordoned by police and for several hours women were not allowed to go to the temple. All this amounts to violation of the fundamental and constitutional rights of people to express our protest against the high handedness and illegal work undertaken by the Government of Gujarat in and around 70 villages of tribal district of Narmada. The protest that was organised in the homes, in private places for which no police permission is needed cannot be stopped by police. The real intention was to terrorize the people and by doing this act they succeeded in their motive to silence the legal and peaceful protest, and up to certain extent they were successful in that. This is the new method to terrorize people adopted by the state. Strong action should be taken against all the government officials involved in these illegal and unconstitutional activities to terrorize activists and tribal people. We are ready to depose before the NHRC with details and documents in person. The NHRC should call the concerned officer on this issue to depose before it. This will facilitate the process of finding the real truth and the real issue by the NHRC.